Six teenagers carried out a "spree" of arson attacks in north London over five days, including a fire that closed the M1 motorway, a court heard. The fire at a Mill Hill scrapyard last April closed a stretch of the road for days and caused damage put at £4.5m. A "core group" of five were among 10 teenagers charged over fires in Barnet, Wood Green Crown Court heard. Three 18-year-olds, a 17-year-old and two aged 15 all deny conspiring to destroy the scrapyard by fire. Some of the teenagers are also accused of carrying out four other arson attacks in two parks in the area. All 10 teenagers were accused of involvement in fires in the London borough between 12 April and 16 April. The M1 fire took place on 15 April. Prosecutor James Brown told the jury they may not have heard about all the incidents in which the "core group" - one aged 14 at the time - were allegedly involved. He said: "The offence that took place on 15 April in the early hours of the morning is an offence which became notorious. "Notorious because, as a result of what these defendants did - setting fire to a scrapyard underneath the M1 motorway - there was an enormous conflagration of flames to such an extent that the fire spread from the initial location of the scrapyard to another that was right underneath the motorway. 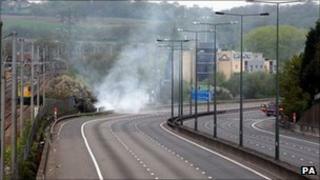 "It caused such an intensive fire that it actually damaged the motorway above. "As a result the motorway was closed for nearly a week." He added that on each occasion there was an agreement between the defendants to commit arson so it was not about who "actually lit each fire but whether or not there was an agreement." The court heard the 17-year-old defendant wrote to a friend: "I told you I wasn't lying, it was me." The court heard searches on the defendants' mobile phones and computers after their arrests found one of them, Johno Johnson, 18, of West Hendon, had looked up how to start a fire and had also texted a female friend suggesting they burn down a derelict house. Messages between two other defendants, Damien McQueen, 18, of Edgware, and Luke Matthews, 18, from Hatfield, saw Mr McQueen boast of how he had screen wash and "extremely flammable" carpet cleaner in his possession, the court was told. Messages from Mr Matthews to another friend were also read out to jurors. One said: "We set fire to a park twice. We might do it again tonight. If the feds come you're going to have to just run." Another Facebook conversation was relayed to the court, in which one of the defendants spoke of his fear of them getting caught. Mr Brown said some of the defendants had also been tagged in Facebook photos taken at the scene of the lesser fires.